Who's Hiring H-1B Visa Workers? It's Not Who You Might Think : All Tech Considered There's been increasing support for the number of H1-B visas given to highly skilled workers. 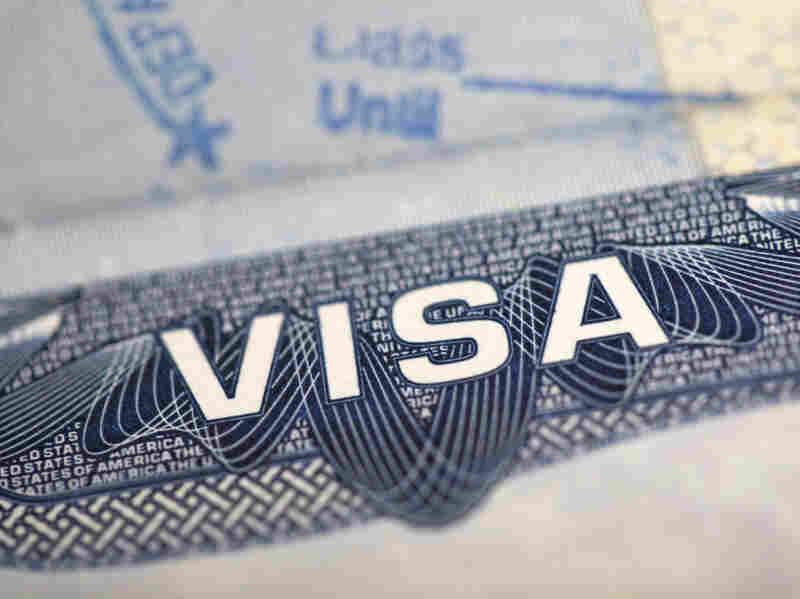 Large tech companies are leading the push for the increase, but the bulk of the visas go to workers at large consulting firms. There's been increasing support for the number of H-1B visas, for highly skilled workers. Large tech companies are leading the push for the increase, but many of the visas go to workers at large consulting firms. The tech industry wants more skilled workers — from overseas. Companies are lobbying hard for Congress to raise the limit on H-1B visas — visas for people with specialized skills — researchers, for instance, or software engineers. Brad Smith, Microsoft's general counsel, recently told NPR that more H-1B visas can't help but be good for the country. "We need to continue to attract some of the best and brightest people in the world to come and join us in world-leading [research and development] efforts," Smith said. But that "best-and-brightest" argument doesn't quite match up with reality — especially when you look at which companies are using the most H-1Bs. Who Is Using the Visas? If you scroll through the government's visa data, you notice something surprising. The biggest employer of foreign tech workers is not Microsoft — not by a long shot. Nor is it Google, Facebook or any other name-brand tech company. The biggest users of H-1Bs are consulting companies, or as Ron Hira calls them, "offshore-outsourcing firms." "The top 10 recipients in [the] last fiscal year were all offshore-outsourcers. And they got 40,000 of the 85,000 visas — which is astonishing," he says. Hira's a professor of public policy at the Rochester Institute of Technology. He's also the son of Indian immigrants and has a personal interest in questions of labor flow across borders. For the past decade, he's been studying how consulting firms use temporary work visas to help American companies cut costs. He says they use the visas to supply cheaper workers here, but also to smooth the transfer of American jobs to information-technology centers overseas. "What these firms have done is exploit the loopholes in the H-1B program to bring in on-site workers to learn the jobs [of] the Americans to then ship it back offshore," he says. "And also to bring in on-site workers who are cheaper on the H-1B and undercut American workers right here." The biggest user of H-1B last year was Cognizant, a firm based in New Jersey. The company got 9,000 new visas. Following close behind were Infosys, Wipro and Tata ‑‑ all Indian firms. They're not household names, but they loom large in tech places like the Seattle suburbs. Rennie Sawade, a software designer with 30 years of experience, grew up in Michigan — watching the decline of the auto industry. And so, he went into computers in search of a more secure career. But that's not how it turned out. "Basically, what I see is, it's happening all over again," Sawade says. Programmers like him tend to be freelancers, or contract workers, and the big consulting firms are the competition. Sawade remembers when he almost landed a plum job at Microsoft. "I remember having phone interviews and talking with the manager, having him sound really excited about my experience and he was going to bring me in to meet the team," Sawade recalls. And then: nothing. He called his own placement agency to find out what happened. "And that's when they told me, 'Oh, they hired somebody from Tata Consultancy.' And they actually told me on the phone, the woman I was talking to said her jaw just dropped when they found out how little Microsoft was paying this person from Tata Consultancy to do this job," he says. Sawade is active in the labor organization WashTech, so he gets complaints from IT workers around the country. The H-1B consultancies are especially big in banking, insurance and pretty much any industry that runs on big computer systems maintained by aging, increasingly expensive American tech workers. He laughs at the notion that a cost-cutting insurance company somewhere is in dire need of hotshot foreign programmers with specialized skills. Because the businesses require current employees to train the new hires from India, he says. "And maybe the people from India aren't necessarily there to replace them — at least not right away. They're just learning the job," Sawade says. Learning the job, he says, so the consulting firm can eventually provide the same service from somewhere cheaper. NPR repeatedly tried to interview the biggest H-1B users, but none agreed to talk. We were able to reach Dean Garfield, head of the Information Technology Industry Council, which counts Cognizant among its members. "Some of the companies are companies — yes — that are providing services that bring greater efficiencies to businesses. But what's wrong with that?" Garfield says. He rejects the notion that Cognizant is using foreign tech workers to undercut Americans. He points out that H-1B workers are supposed to be paid "prevailing wages." In practice, though, that rule is rarely enforced. In a 2011 report, the U.S. Government Accountability Office said worker protections are "weakened by several factors" and that oversight is "cursory." Garfield acknowledges the system isn't perfect. "The main, legitimate criticism right now — which is one we would level as well — is that the accountability mechanisms are not fully integrated and not seamless. It's more a 'check the box,' " he says. But he also takes exception to criticism that lumps the consulting firms together — something he calls "offensive." "There is a lot of anti-India sentiment in many of the criticisms and articles around this that I think are completely unfounded and unnecessary," Garfield says. But it's not offensive to Neeraj Gupta, who is a U.S. citizen. He came here on a student visa for his master's degree in electrical engineering. Gupta spent part of his career working for the Indian consulting firm Patni (now called iGate), and he says it was obvious they were using H-1B workers to replace Americans. It happened on almost every one of his projects, he says. On some of those projects even the clients had misgivings. "I had people come to me and tell me that the No. 1 issue that they faced — even as they were offering this work — was the fact that they had longstanding employees, and the implications of them losing their jobs," Gupta says. He now runs what he calls a "domestic outsourcing" company — also a consultancy, but his workers are American. So he does have an incentive to criticize the H-1B system. At the same time, he doesn't want to eliminate it. He believes U.S. tech companies are in dire need of highly skilled foreign workers. The problem, he says, is that so many of the visas are gobbled up for middle-of-the-road tech jobs already being done by Americans.